Use Learning Tools to help with reading fluency and comprehension. Some Learning Tools features are not supported in all languages. For details, see Language support. Column Width changes line length to improve focus and comprehension. Line Focus removes distractions so that you can move through a document line by line. Adjust the focus to put one, three, or five lines in view at a time. Note: The Line Focus option is available only to Office Insiders for now. Text Spacing increases the spacing between words, characters, and lines. 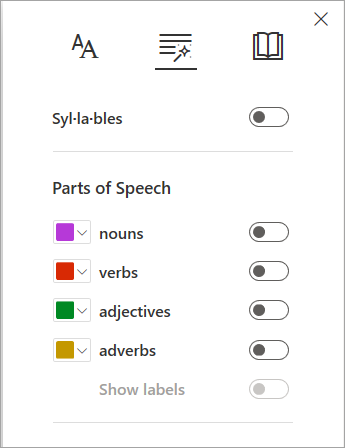 Syllables shows breaks between syllables, to improve word recognition and pronunciation. Read Aloud lets you hear your document as each word is highlighted. Note: Use the playback controls to start and stop the narration, to change the speed of the reading, and to switch between reading voices. On the View tab, in the Document Views group, select Immersive Reader. 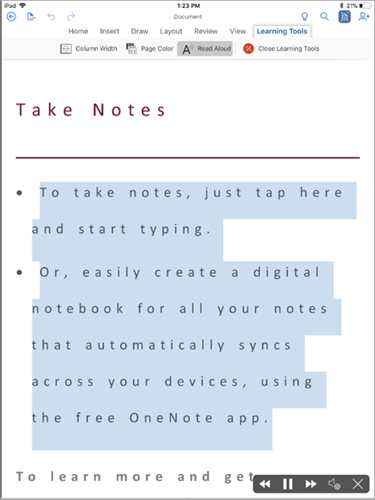 Your document opens within Immersive Reader. You can do one or more of the following in Immersive Reader, depending on how you want to focus on the content in your document. Select Play at the bottom of the window to hear your document read aloud and to see the text highlighted simultaneously. The narrator starts reading from the top of your page by default, unless you have selected a word, in which case it will start reading from the selected word. Select Pause to stop narration. 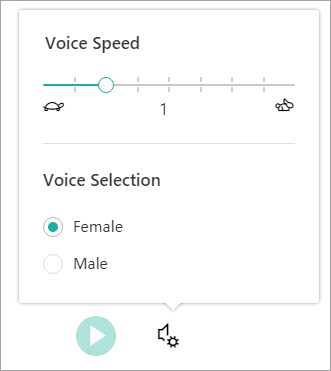 Select Voice Options on the top right of the document to change the speed of narration. You can change the appearance of your document by using Text options. The choices you make in text options can help bring more attention to the content and remove visual distraction. 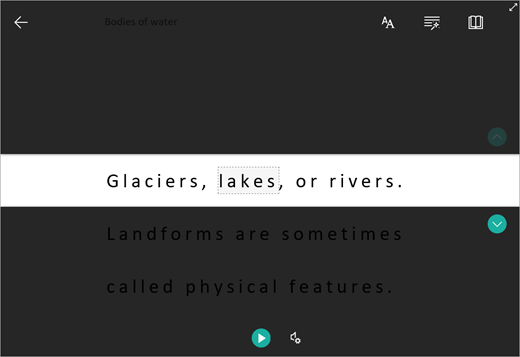 Set Text Size, Spacing, Font, and Themes that suit your learning needs. You can increase or decrease text size and the amount of spacing between letters and words. The Theme color you select becomes the background color of the document. Syllables to break words into syllables. Nouns to highlight nouns in your document in purple. Verbs to highlight verbs in your document in red. Adjectives to highlight adjectives in your document in teal. Line Focus enables readers to narrow the focus of their reading experience by highlighting sets of one, three, or five lines within their chosen material in Immersive Reader. Use the toggle to turn it on or off. Picture Dictionary gives you the ability to click on any single word and have it read aloud. 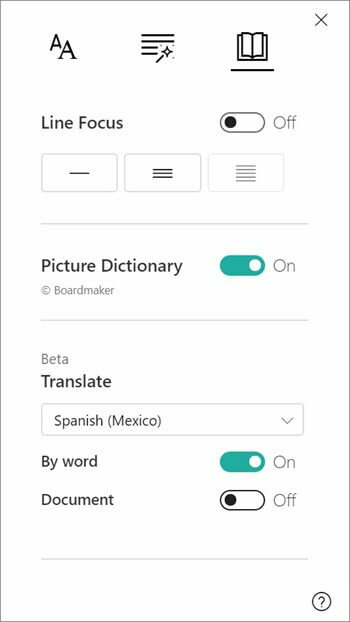 Translate gives you the option to change the language of the text. Click the Close icon to exit Immersive Reader. Slide the toggle to the right to launch the Learning Tools tab. On the Learning Tools tab you have the following tools that can assist you while you read or edit your document. Column Width can be used to change the width of the line length. This helps to reduce the adverse effects of visual crowding and allows improved focus and comprehension on words and characters in a text-rich document. Page Color can be set to be Sepia (pale yellow page with print feel), Inverse (black background with white text) which makes the text easy to scan and consume, or left at None. Read Aloud lets you hear your document and see each word highlighted simultaneously in your document. You can use the buttons that appear on the bottom right corner of your screen to control the reading. Choose the Play/Pause icon to start/stop the narration. Select the Next icon if you want the narrator to skip the current sentence and start reading from the next paragraph. Select the Previous icon if you want the narrator to skip the current sentence and start reading from the previous paragraph. You can change the reading speed using the Settings icon. Text spacing is available for all languages except those written with complex or connected scripts. For example, Arabic isn't supported. Syllabification is available for Basque, Brazilian, Bulgarian, Catalan, Croatian, Czech, Danish, Dutch, English, Estonian, Finnish, French, Galician, German, Greek, Hungarian, Icelandic, Italian, Kazakh, Latvian, Lithuanian, Norwegian (Bokmål), Norwegian (Nynorsk), Polish, Portuguese, Romanian, Russian, Serbian, Slovak, Slovenian, Spanish, Swedish, Turkish, Ukrainian, Welsh languages. Text must be set correctly. For more details, see set language preferences. If the text is set to an unsupported language, it won’t be syllabified, even if the text should be supported. Example: If English text is copied into a Chinese document, the English text must be selected and set to English; otherwise, the text won’t be syllabified. Read Aloud doesn't support RTL languages. Read Aloud reads text in the default speech language of your operating system. For information about how to add additional text-to-speech voices, see How to download Text-to-Speech languages for Windows 10.